It's exceedingly difficult for even the most capable of jewelers to sufficiently capture the brilliance of stars and other celestial bodies in their work, yet that's precisely what Van Cleef & Arpels has accomplished with this elegant Starbust Ring. 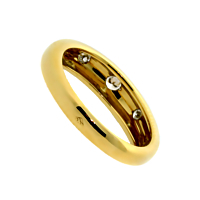 3 Diamonds sparkle brightly amidst recessed positions within the 18k Yellow Gold band, each one being flanked by designs evoking rays of emanating sunshine. The effect is positively entrancing!